who will be the first guy to enter this Gods forggoten map? what...where...i wanna be on it....what does it look like? woop woop fit for a bear! is this even a real world ? like 1 tht sum1 has created? yes gtfo! unless u a bear? will be remembered for what? ooh i see...wnt some honey? he isnt a polar bear i am he iz a grizzly!! I will be stamping unto Fantasia. Watch out for those bears they seem to be to mmmmmmm hyper......who knows what they'll do to you when you sleep. One summer we killed over 30 black bears and 9 grizzlies, it was one of the crappy things about living on a ranch in Northern Alberta. No calling meh a whore Pengy, I prefer teeny bopper, Britney Spears is the whore! you killing bears >: ( kittie boy!!! SFD wages war on the bear killah!! LOL some fckd dude, I am from a place called Paddle Prairie, no joke the bears are pretty thick there and the dirty buggers often get into the garbage or bother our horses, then we have to take steps to prevent it. lol paddle priarie nice name!! LOL as long as your brothers stay out of my yard we should have no issues, but if they do come into my yard I will let the air out of them in short order. what do the bears look lik round youyr end? btw that house at the end of paddle prairie....its got loads of garbage wer going tonight u coming vanilla? We have mostly black bears, they are small (comparatively) fat and lazy the odd grizz shows up but we kill them pretty quick. I have had a few bears sneak up pretty close to me , it won't happen again. I once watched a yearling grizzly kill a 3-4 year old Black bear , it was a pretty ridiculous thing to watch, people don't realise how powerful grizzlies actually are. obv i am cumin brown bear!! Fate has the best kingdom theme ever. 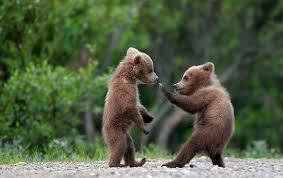 Thats just cause vanillas brother bears are ninjas they are probably swarming your house now and you don't even know it. LOL, I wouldnt be surprised. hey Jewels, drop me a line tonite on the skype crap.